The film is based on a 1958 novella of the same name by Truman Capote. Capote had become a literary sensation in 1948 at age 24 with the publication of his first novel, a best-seller, Other Voices, Other Rooms. By the time he completed Breakfast at Tiffany's, the still-young author was well-established in the literary world and a celebrated enfant terrible, and his much-anticipated novella would appear in serialized form in Esquire magazine not long before Random House published it as part of a collection along with three stories. Capote would reflect on his novella a few years later and note that Breakfast at Tiffany's signaled his evolution toward "a more subdued, clearer prose" style. This new approach culminated in his 1965 "non-fiction novel," In Cold Blood. Capote would sell the film rights for Tiffany's to Paramount with the desire that his friend Marilyn Monroe be given the role of free-spirited protagonist Holly Golightly, but this was not to be. Blake Edwards (Days of Wine and Roses, The Pink Panther, Victor/Victoria) signed on to direct, George Axelrod (The Seven Year Itch) wrote the screenplay, Franz Planer (The Caine Mutiny, The Children's Hour) photographed, Henry Mancini (Days of Wine and Roses, Charade) composed the musical score. And Audrey Hepburn starred. Audrey had, of course, already won a Best Actress Oscar for her performance in William Wyler's Roman Holiday (1953), her first starring film role. She followed this star-making turn as the European princess who takes a brief Roman holiday with similar roles as enchanting gamine types in films like Billy Wilder's Sabrina (1954) and his Love in the Afternoon (1957), and Stanley Donen's Funny Face (1957). 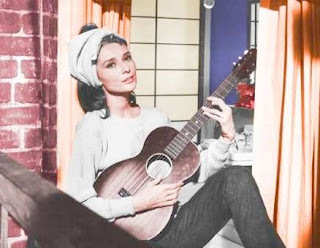 She would earn an Oscar nod for Sabrina as well as for her more dramatic portrayal as the titular nun in Fred Zinnemann's The Nun's Story (1959) before taking on Holly Golightly in Breakfast at Tiffany's. Some admirers of Capote's novella have groused about the selection of Audrey Hepburn to play a young "hillbilly" girl who's reinvented herself as a New York City party girl/café society maven. 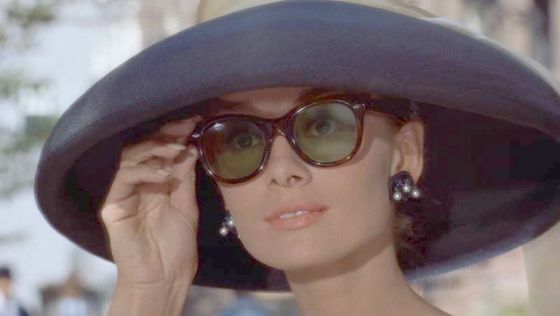 Audrey is too chic, too European, they will say. There are also complaints that the character Truman Capote created - Holly's new neighbor, her platonic, probably gay, writer friend - was rewritten as a handsome blonde, blue-eyed ladies' man (George Peppard) who is "kept" by a wealthy married woman (Patricia Neal), but pines for Holly. 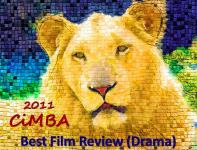 And there is dissatisfaction with the film's happy ending vs. the book's more downbeat denouement. But the film version of Breakfast at Tiffany's was simply a loose adaptation of Capote's story. Shifted from New York during the bleak World War II era to the swinging late '50s/early '60s, it was conceived and crafted as a contemporary, mass-appeal romantic comedy. 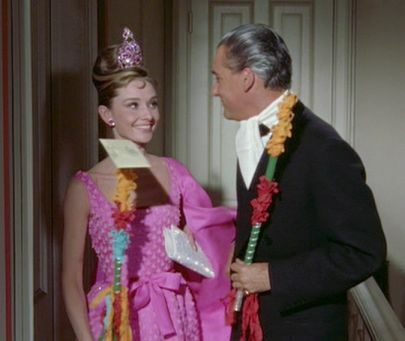 To that end, Blake Edwards whipped up a lovely soufflé of wistful romance, and it is Audrey Hepburn with her abundance of elfin, Givenchy-wrapped charm that makes the film the timeless classic it is. 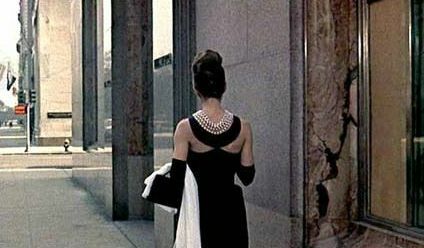 Even not-easy-to-please Truman Capote allowed that she "did a terrific job" in the role of Holly Golightly. The glorious New York City setting, Henry Mancini's quintessential score, Patricia Neal as a rich philandering wife, Orangey the marmalade tabby (reportedly the only cat to win two Patsy Awards) and George Peppard's baby-blue eyes are icing on the cake. 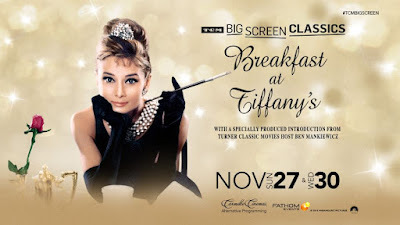 Breakfast at Tiffany's was nominated for five Academy Awards: Best Actress, Best Adapted Screenplay, Best Art Direction, Best Musical Score and Best Original Song ("Moon River"). Henry Mancini won Oscars for his score and for the song and also won five Grammys that year: Best Soundtrack Album, Best Performance by an Orchestra, as well as Record of the Year, Song of the Year and Best Instrumental Arrangement for "Moon River." Over the years since Breakfast at Tiffany's was released many apologies for Mickey Rooney's "yellow face" caricature portrayal of Mr. Yunioshi have been extended - from the actor himself and from Blake Edwards, who chose to take the character in that direction. We should remember that when the film was made such a portrayal was not viewed as inappropriate - see also Marlon Brando in Teahouse of the August Moon (1956). Thankfully, this is no longer the case. 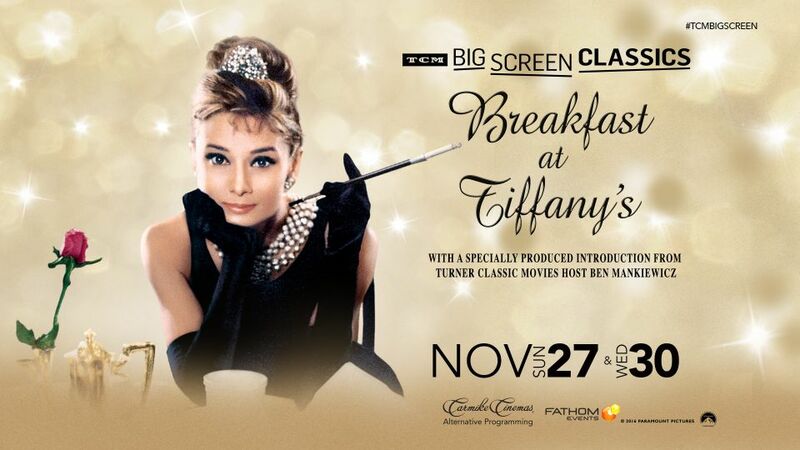 Audrey Hepburn sings "Moon River"
A wide range of classic films, something for just about everyone, has been presented by TCM/Fathom throughout 2016: celebrating the 75th anniversary of The Maltese Falcon (1941) in February, celebrating the 60th anniversary of The Ten Commandments (1956) in March, On the Waterfront (1954) in April, celebrating the 30th anniversary of Ferris Bueller's Day Off (1986) in May, Willy Wonka & the Chocolate Factory (1971) in June, Planet of the Apes (1968) in July, Animal House (1978) in August, celebrating the 60th anniversary of The King and I (1956) in August, Dr. Strangelove (1964) in September, The Shining (1980) in October and Breakfast at Tiffany's in November. Up next month, From Here to Eternity. Click here to find out more. Truman Capote: Conversations, Truman Capote and M. Thomas Inge (Univ. It's a charming film and much of that has to do with Ms. Hepburn who is delightful as Holly. Of course, Orangey almost steals the film from her :). Blake Edwards was the first director I ever became aware of (Wilder and Hitchcock were close behind) when I saw both The Pink Panther and A Shot in the Dark and recognized his name, thinking maybe I should start paying attention to who directs and writes. 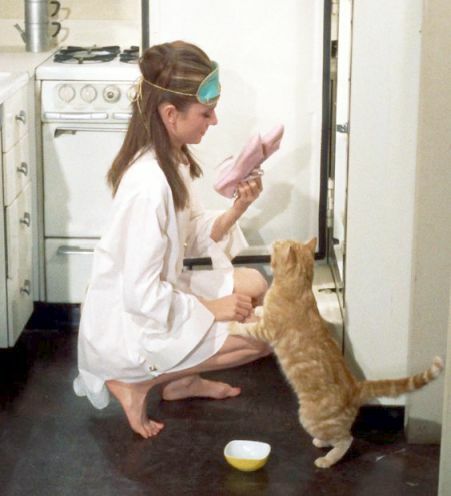 Orangey may not have stolen the film from Audrey, but he surely overshadows Mr. Peppard as leading man! I became aware of Blake Edwards early on, too. I remember Experiment in Terror and Days of Wine and Roses, both of which I saw before Breakfast at Tiffany's. But I knew of Hitchcock before any other director.